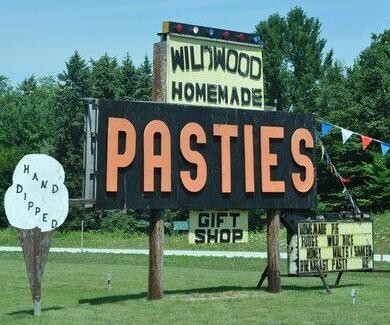 We are fortunate to have many pasty shops in Michigan, and especially in the Upper Peninsula! I am even more fortunate to have friends willing to bring me pasties from their U.P. vacations. Today, we review Wildwood Pasties, located in Brevort, 20 miles west of the Bridge on US 2. We also revisit a couple of our previously-blogged pasty experiences. Another friend in my pasty supply network brought us pasties from a long-time favorite and highly-rated UP source, Hiawatha Pasties. Both shops offer frozen pasties, perfect for the trip down state. What to do with our abundance of pasties? A pasty cook-off, of course! Wildwood is a quaint, clean shop that also sells amazing pies. In fact, reliable sources tell us that the pies are even better than the pasties! Making about 200 pasties by hand every day, Wildwood pasties are local favorites. They are open April through November and make several varieties, including beef, Italian sausage, breakfast sausage, and veggie. They also offer special venison pasties in October and November. (We look forward to trying those!) We tasted the traditional beef pasty. Wildwood pasties have a thin, hard, and almost crunchy crust. The crust was reminiscent of Suzy’s pasties, another UP pasty purveyor. Wildwood makes homemade gravy to accompany their pasties. We didn’t try the gravy, but if you’re a gravy lover, this crust would likely stand up well. 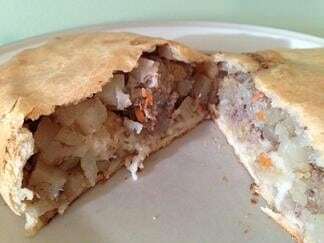 The Wildwood pasty filling had a nice blend of beef and potatoes with only a few carrots. Our pasty preference? Hiawatha. In our opinion, the Hiawatha pasty had a tastier, flakier crust and a better balance of meat and veggies. That said, the Wildwood pasty was a good, solid meal and we’d be happy to try their other varieties. Crust to Filling Ratio = 8… there was a generous amount of filling, but the crust is a bit thin. Filling Consistency/Flavor = 8… the filling is tasty, but we prefer a few more veggies for moisture and flavor. Flake-O-Meter = 5, the crust was firm with a slight crunch, rather than tender and flaky. Overall Savory Index= 7… Overall, this was a good pasty, but the crust wasn’t our favorite type. Wildwood scores a respectable average of 7. Have you tried Wildwood? What did you think? You can learn more and visit them on Facebook here. Update on The Pasty Place… Since our last pasty post, we stopped again at quaint, inviting The Pasty Place in Harrisville. Last time, we tried the traditional Cornish pasty. This time, we also sampled the house pasty, which adds additional seasonings and veggies. The Cornish variety earned a solid 8.15 KPI average. We felt the house pasty was significantly tastier; it was juicier and more savory than the Cornish variety. In addition, we tried their seasonal Michigan cherry pasty. We admit that we were a bit skeptical of a sweet pasty. Doubters no more, we loved it!! Be sure to stop by The Pasty Place next time you’re on Michigan’s sunrise side. Update from our Kitchens…The amateurs ventured into the kitchen again. 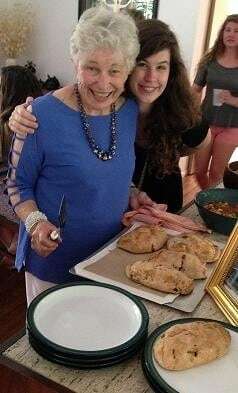 We sampled another family member’s foray into pasty making. You can find the recipe in a previous post. However, this time the crust was made with vegetable shortening. Delicious. More proof that if you’re leery of lard, you can get a tasty, flaky crust with a “healthier” alternative! Tagged Pasty, Pretty Awesome Pasties, upper peninsula.